TD Bank has multiple credit cards in their portfolio. One of them is the TD First Class Travel Visa Infinite. I think this can be a great card for people who bank with (or are willing to bank with) TD and have an All-Inclusive account, as the fee is waived. For people who don’t / won’t bank with TD will find that other cards will serve them much better. As a no-annual fee card (ie your fee is waived due to banking relationships) this is a very strong card, and likely the best in the market. The TD First Class Travel Visa Infinite is a fixed value return card and offers 1.2% – 1.5% return on all purchases and 3.6%-4.5% return on purchases made through Expedia for TD. If you are willing to use Expedia for TD for your travel, you will do well with this card. The more money spend on Expedia for TD, the more this card makes sense for you. If you don’t put value on banking with TD and travel is not a major expense for you, then you will likely do better with other cards in the market. The rewards points of the TD First Class card are TD Rewards. TD Rewards have a relatively confusing redemption value, when compared to some other cards. It seems TD is really pushing you to use Expedia for TD here. They have set the point value in the ½ cent per point range, rather than the 1 cent per point range, which causes some unnecessarily complicated math. * If you can earn your TD points at Expedia for TD purchases, you can always redeem there as well, so there is no need to redeem at Book Your Way or for cash. First off, you must request the redemption when you are booking your travel. When you make your booking, the entire price of the trip will be charged to your card (earning you the bonus points on the entire trip). Then a few days later, a statement credit for the value of the points redeemed will show up on your card as a totally separate line item. I like this for 2 reasons: you earn the bonus travel points (4.5 TD rewards / $) even on the points redeemed, and if you are getting the travel reimbursed or need insurance, the entire amount will show up on your credit card statement. While this is a “travel redemption”, I really see this as method as being a statement credit that you can release only when you have a valid travel charge. While everyone is different, I like to psychologically separate these 2 events so I “feel” like I got a release of my rewards that had exact value. Others might prefer to think they got their trip paid for by points. Finally, if you do have any type of travel spend that you are doing through Expedia for TD, then you should ALWAYS redeem your points in this fashion as it will get you the best value. The point redemption comes as a statement credit for the amount redeemed. Book your way is the equivalent way that many other credit card programs that I like allow you to redeem your rewards. Programs such as Scotiabank American Express and Capital One Aspire World work in this way. Redeeming for cash is a bad proposition. You can redeem 10,000 points for a $25 statement credit, yielding a mere 0.25 cent per point. The minimum redemption is $25 then it works out to 400 points for any additional $1 that you want to redeem. Since the other methods stated above also redeem rewards in the form of a statement credit, you should really try to get an Expedia for TD travel charge onto this card as that would double the value of your rewards and you can still see that redemption as a “cash” reward. The annual fee on this card is $120, with an authorized user fee of $50. This is higher than most other cards I would line it up against. I also don’t think anyone should be paying this annual fee. This fee can be waived if you have an all-inclusive banking package with TD. In my opinion, TD has one of the best retail banking presence in Canada and there are many people who bank with TD anyways. To them, this card should be seen as a no-annual-fee card. As a fee-free card, this is a great card. If you do not already bank with TD, an all-inclusive banking package requires a $5000 minimum balance to be kept and there are other perks as well. I think that anyone considering getting this card should really set up an all-inclusive banking package with TD to get the fee waived. Assuming you want to get this card and you have to tie up $5000, the $120 annual fee represents a 2.4% tax free, no risk return on your investment. I think that is pretty good in the current interest rate environment. Personally, I value this as a $200 sign up bonus, since, as I mentioned before, I think that you should get a fee waiver by banking with TD if you are going to get this card. In my opinion, a 50% fee waiver has no value, though if you are on the fence, it might be helpful to get the card into your hand before you set up your TD bank accounts. Note that this sign-up bonus is available through referral links on this page. The public signup bonus is worth less than this. I think this card most naturally lines up against the BMO World Elite card. The BMO World Elite card gives a 2% return towards travel booked through BMO travel. BMO also recently started giving a fee waiver for a credit card for having a banking package with them. This BMO World Elite card does not give any bonuses for any types of purchases, however. In comparison, I think that TD has a better retail banking presence than BMO, so there are people who will already be TD customers who will not want to switch. Those who are relatively bank agnostic can set up a BMO account and get the BMO World Elite fee waived and get 2% towards travel on all purchases. The sacrifice is the bonus return that travel gets with the TD card. Though, I think that the average non-TD customer will do better with the BMO World Elite card. The PC Financial World Elite card is a premium level card that carries no annual fee and gives 1% return towards purchases as a base and gives bonuses for PC grocery, ESSO gas, Shoppers Drug Mart and PC Travel. 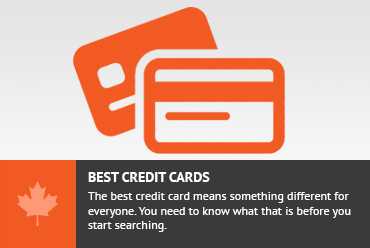 When lined up, the PC card offers a larger return on many bonus categories and returns rewards in an easier form (credits towards groceries) than the TD. The 3% return the PC card gets at PC travel rivals TD’s bonus on travel with Expedia for TD. The TD card also is stronger in the “everywhere else” spend. For someone who shops at PC grocery stores, the PC card should already be in your wallet. The TD card can be a nice compliment to that for people who bank at TD anyways but not something I would get outright as a replacement. For people who don’t shop at PC stores, the TD card is much stronger. The American Express Gold card has a hefty $150 annual fee that cant be waived. It offers Membership Rewards at a rate of 1 per dollar spent on everything and double on gas, grocery, drug stores and travel. The comparison gets muddy since Membership Rewards are really valuable for transferring over to Aeroplan, British Airways Avios and other frequent flyer programs. People who don’t know how to get good value out of frequent flyer programs will not do well using this card. The TD card does not have any frequent flyer program affiliation and is a pure fixed value return card. I think this comes down to a straight personal preference. I think the average person will do much better with the TD First Class card, though. The MBNA Smart Cash is, in my opinion, the strongest cash back card. For people who value straight cash instead of having to deal with the redemptions through travel etc. the MBNA Smart Cash card is a stronger card than the TD. The MBNA Smart Cash card gets 1% cash back on all purchases and 2% cash back on gas and grocery purchases. Rewards are sent automatically when $50 in rewards are earned. For those who might redeem their TD rewards for cash, they would only receive 0.75% return, so the MBNA Smart Cash would be stronger on all counts. For people who value simplicity, the MBNA Smart Cash card is a stronger card than the TD card. The insurances offered on the TD First Class card are relatively standard for this level of card. There is nothing that I noted as specifically better or worse than average on this front. The TD First Class card is a great offering by TD. 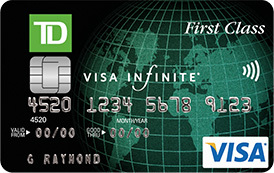 For people who bank with TD, they will get the annual fee wiaved on this card and can see this as a no annual fee card. For a fee free card, this is at the top. Those who purchase travel from Expedia for TD more will get better value from this card. And you really do need to have some travel purchased through Expedia for TD (at least for redeeming rewards) to get any value from this card. For people who don’t (or wont) bank with TD and who don’t travel very much, this is not a good card. I had the TD Infinite Travel Card for Expedia for a year and a half before I cancelled it after discovering there is a serious gimmick that greatly reduces the value of the card to users. The prices on the Expedia for TD site, where one has to use to gain the full advertised benefit, are in fact often higher, sometimes much higher, than the same product (ie. hotel) on the regular Expedia site. This untransparent price differential , together with an 2015 announcement by TD that points for regular non-Expedia booked travel were being depreciated, quickly sent us looking for another, non TD card. And we do bank at TD and did not have to pay the fee, but since we were actually being charged a premium Expedia for TD, the value just wasn’t there. Don't subscribe All Replies to my comments Notify me of followup comments via e-mail. You can also <a href='https://www.creditwalk.ca/comment-subscriptions/?srp=4619&srk=2648578ecea05c83754707575dc5a494&sra=s&srsrc=f'>subscribe</a> without commenting.